Since I started this bloglet, back in 2009, people have emailed me – and gotten in my face in public – because my bio clearly says that I was an chef for a huge chunk of my adult life and I don’t write about food OR food and beverage pairings. I also have never written about cocktails, for one very sound reason: I don’t like cocktails. I don’t drink cocktails, at least not until very recently, and have almost zero interest in the whole notion of spoiling perfectly good spirits with fruit juices and other liquors and twists and bitters and spices and parrot droppings and whatever the hell else today’s adventurous “mixologists” (these used to be “bartenders”) are forcing upon poor, innocent shots of booze. Now, that reasoning has been largely rendered moot. Legal standards, health regulations, and ATF rules mostly eliminate any complaints about purity of spirits, which means that they can – and, I believe fervently, should be – tasted and consumed and judged purely on their own merits. I’ve routinely deleted, unread, the hundreds of emails I get from PR firms, touting this or that new cocktail, based on literally any event appearing on a calendar, anywhere. This week, I got seventeen emails about “Halloween cocktail suggestions”. None of these, to my great disappointment, included candy corn in the recipe, although seven featured pumpkin. 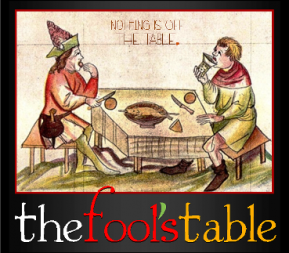 For 2014, I resolved to remedy some of this influx of email inquiries by occasionally writing something about food…hence the banner at the top of this post, a working link which will take you to my new WordPress blog called “The Fool’s Table“. In its pages, You’ll find out why I didn’t write about food, why I think the whole current mania for the “proper” food and wine/beer/spirits pairings is vastly over-done, what I think of most of the trends in dining – such as the whole tipping brouhaha, the Big Gastropub Scare, and the whole notion of the “celebrity chef” – and why nobody wants to have dinner with me (if they have a brain in their heads). In The Fool’s Table, my iron-clad prohibition about never writing anything negative (except about Anheuser Busch, Gallo, and people who sue for specious copyright infringement) does not and could not apply, if I were to write the thing at all. There will be some Snark and I cannot, in good conscience, apologize for it because, damnit, some restaurants and food trends are just simply bad ideas, badly done, or bad intentions hiding behind a facade of clever marketing. 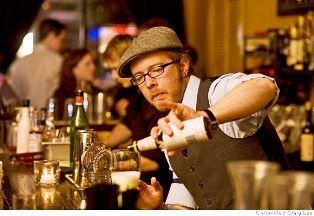 I like brewers, distillers, and winemakers and have NO desire to pick on them or single anybody out for criticism. I think about 95% of all restaurateurs are misguided, at best, or ego-ridden jackasses, at worst. And I cannot – will not – pretend otherwise. Occasionally, if it’s relevant, posts from here will also be launched there, and vice-versa. The very first review post, in fact, will be “simulcast” this way, a recounting of a very pleasant evening spent at a private function at our local, Seattle-area outpost of a really fine restaurant chain based in Canada, Earl’s, a former beer ‘n’ burger joint that’s grown up quite nicely. 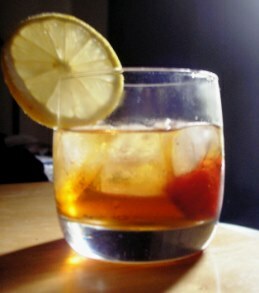 In upcoming posts, here, there will be the occasional mention of a cocktail, instead of my continuing to try to pretend that they don’t exist, and maybe even a recipe or two, if any of my advisors on cocktails tell me they’re particularly fine. I’ve been asked, several times, to create a signature cocktail, based on my history as a chef, and I’ve done it, mostly to not appear any more curmudgeonly than I already do. I’ll toss those in, (starting with the drink to your right, my first and most successful concoction, The Pawley’s Spike) as they have all, all seven of ’em, been featured successfully on drink menus in various parts of this weird, cocktail-obsessed country. 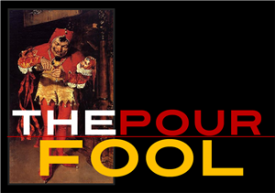 2014 in The Pour Fool has featured a LOT more coverage of spirits and that will continue, as will more wines and beers, as I shift to an honest attempt to post daily. SIPS – Short Informational Product Shots – has already launched and the response has been very favorable. These bite-sized reviews let me recommend more great beverages and do it with more frequency, all to the good of the primary mission of this bloglet: helping YOU find great things to drink. Longer posts will still appear, when needed, but small, tasty bites are a nice change of pace, even for a verbose ninny like me. Here’s the new version of The Pour Fool and it’s new little brother, The Fool’s Table. Eat. Drink. Think, Choose. A simple idea and one with which I can help.